THE NIBBLE has always written about better-for-you foods. But each January, when people make their resolutions to eat better in the new year, we declare it Healthy Food Month. In January, we don’t tempt you with gourmet potato chips, artisan chocolates or lemon meringue pie. Instead, we show that it really is easy to find or make delicious foods that are good for you. Take salmon. We all should eat more of it; but buying fresh fish or defrosting frozen fish, then cooking it, takes time and planning. You have to cook the fresh or defrosted fish in a day, before it starts to go “fishy” and deteriorates. (NOTE: Do not thaw frozen seafood at room temperature; it enables bacteria to multiply. Instead, thaw it in the fridge, allowing one to two hours per pound; or defrost it in the microwave right before cooking). 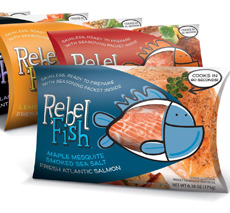 We have become very fond of Rebel Fish, the first U.S. branded line of fresh salmon that comes prepackaged with seasoning packets. Always fresh, never frozen and of very high quality, the product should become an instant favorite with consumers. A scrumptious fish fillet can be cooked in 90 seconds. It’s all natural: no artificial flavors or preservatives. The founders of Rebel Fish believe that we would eat more fresh fish if it were easier to buy and prepare. They’ve made it super easy. 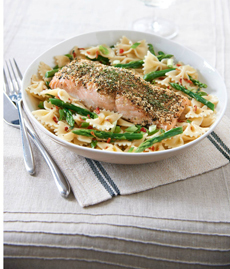 The salmon is packaged in an innovative way that preserves freshness. The shelf life is 7 days or longer. The fillet rests in a plastic tray inside the outer carton. All one need do is roll back the plastic and place the tray in the microwave. It’s fool-proof. It can be cooked on the stove top or in the oven, but you can’t beat the 90-second microwave technique. The result: moist, silky, flaky salmon that’s the best we’ve ever cooked at home. We don’t even use the seasonings. We prefer the fish plain (that’s how tasty it is), or with a touch of freshly-ground pepper. Top: Each flavor is packaged in a different bright color. Second: What’s in the package? One six-ounce salmon fillet and a seasoning packet. Bottom: A 90-second cooked filet atop salad greens. All photos courtesy Rebel Fish. The only difference is the seasoning packet. Frankly, the blends are not our cup of tea—too complicated, with (egad!) added sugar. We, and likely most retailers, would prefer only one SKU (stock keeping unit*, more in the footnote at the bottom). The MSRP is $5.99 per serving. We’re more than happy to pay it. *SKU, stock keeping unit, is a retailer identification that allows a product to be tracked for inventory purposes. Each size, flavor, etc. has a different SKU. Thus, the six different flavors of Rebel Fish require six SKUs. bell pepper and crumbled cotija cheese. Bottom: With asparagus and baby potatoes. Photos courtesy Rebel Fish. WHERE DOES THE SALMON COME FROM? 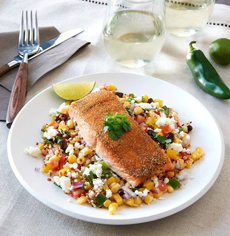 Rebel Fish salmon is raised in pristine Pacific Ocean waters. It is farmed rather than wild, but the fish are isolated and contained in a pure environment that nearly replicates the wild and may be even better: guaranteed food, clean water, space and habitat without predators. 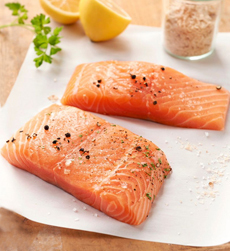 Conditions are ideal for producing premium salmon with great flavor and delicate texture. Farming ensures a reliable year-round supply of fresh salmon. Rebel Fish salmon are nurtured throughout their natural growth cycle to ensure their welfare, as well as to guarantee high quality. State-of-the-art, stress-free farming practices are both sustainable and healthier for the fish. The program is SQF certified, which assures wholesale buyers and retail customers that food has been produced, processed and handled according to the highest standards. SQF is a food safety program that is recognized globally for food safety certification, and is the only program that the Global Food Safety Initiative (GFSI) endorses for food production, manufacturing, storage and distribution agencies. 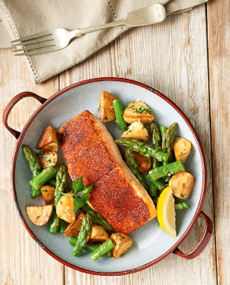 The brand’s parent company is Marine Harvest Group, the world’s leading seafood company and largest producer of farmed salmon, with top certification. Farmed salmon is as nutritious as wild salmon. In fact, a recent study by the U.S. Department of Agriculture revealed that farmed salmon typically has more omega-3† fatty acids than wild salmon. Note that actual amounts can fluctuate as they are influenced by factors such as species of salmon, water temperature, type and availability of food, and stage of maturity. One big difference is that farmers can create consistent levels of omega-3s in their salmon by controlling the amount and composition of the feed to produce consistently nutritious salmon. Rebel Fish Salmon is an excellent source of protein and vitamin D that contains natural omega-3 fatty acids in addition to other critical vitamins and minerals including iron, zinc, and vitamins A and B. 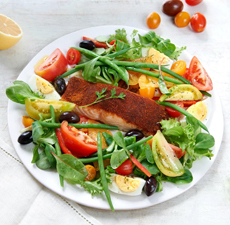 The American Heart Association recommends eating fish, especially fatty fish such as salmon, at least twice a week to ensure you get plenty of heart-healthy omega 3 fatty acids. What about the name? The company says that it encourages consumers to “rebel against the ordinary” when it comes to meal preparation. †Omega-3 fatty acids are healthy fats that may promote brain development, heart health and may also reduce the risk of chronic disease. Seafood is a natural source of two healthy omega-3 fatty acids: docosahexaenoic acid (DHA) and eicosapentaenoic acid (EPA). Since our bodies cannot make omega-3, it’s important to regularly include them in our diets. The American Heart Association recommends that adults have two servings of omega 3 per week to maintain optimal health benefits.